Copyright 2010 Geoff Sobering - Non-commercial use allowed with attribution; please feel free to link anywhere inside this site. In 2009 I finished re-building my DN trailer with and enclosed box. 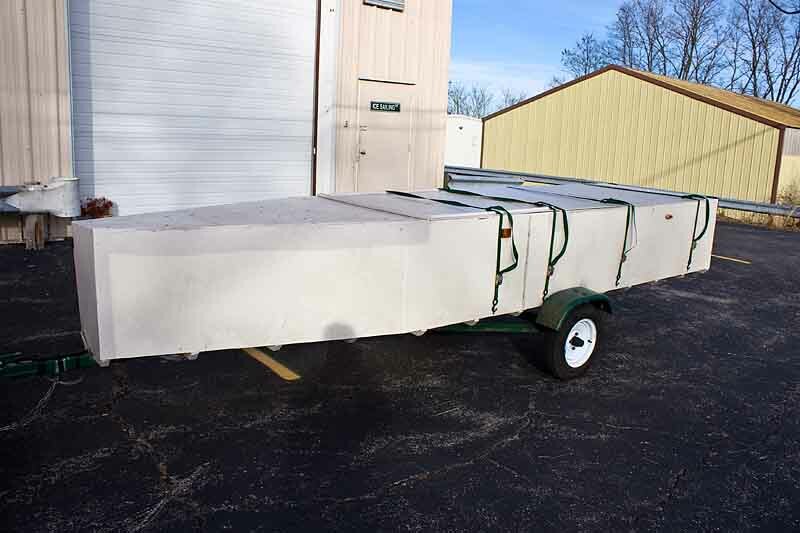 My goal was to have a trailer that would allow storage, setup, and tear-down of a single boat program quickly and eaisly. I also wanted to be able to store the bukly parts of a second DN program (sails, mast, plank, and boom) so that two could travel to a regatta without any major parts of the second DN program in the car (the hull of the second boat rides on the roof). This turned out to work well in 2009-2010 when I was able to help introduce Gavin Clarke, a new sailor in the Madison area, to iceboating with my spare DN (more about that). I plan to add more details about the construction, but for now there are just some photos with short captions.